When you think of the Rocky Mountains, sand dunes are probably not the first thing that come to mind. While driving across southern Colorado earlier this month, however, giant white sand dunes glimmered in the distance. 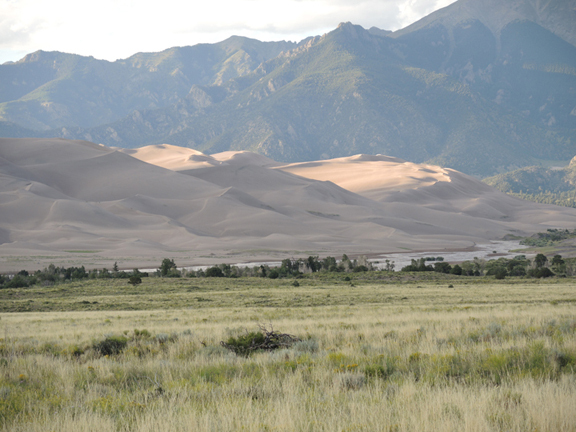 No, it was not a mirage; it was Great Sand Dunes National Park and Preserve. Sprawling across the arid San Luis Valley between the San Jose Mountains to the west and the Sangre de Cristos to the east, the dunes cover 30 square miles and rise as high as 750 feet. They are the tallest dunes in North America and were formed, and continually maintained, by a complex interaction of geology and weather. Over the millennia, according to the National Park Service, rocks from the surrounding mountains eroded and their sandy sediments were transported by stream to the valley floodplain. Prevailing southwesterly winds then carried the sand grains toward a low curve in the Sangre de Cristo Mountains, where they accumulated in a natural pocket. On occasion, when the wind direction reverses during storms, the sand is pushed back toward the west. This process causes the dunes to grow vertically. Two mountain streams, the Medano and Sand Creeks, also border the dunes. They capture sand grains from the eastern side of the dunes and carry them back to the valley floor. This effectively recycles the sand and re-exposes it to the winds. While the forces of wind and water are continually reshaping the massive dunes, they essentially remain in the same position. Massive sand dunes nestled against the foothills of the Sangre de Cristo Mountains, Great Sand Dunes National Park, CO. Image Credit: The Weather Gamut. This entry was posted in weather and tagged national parks, travel, wind by Melissa Fleming. Bookmark the permalink.